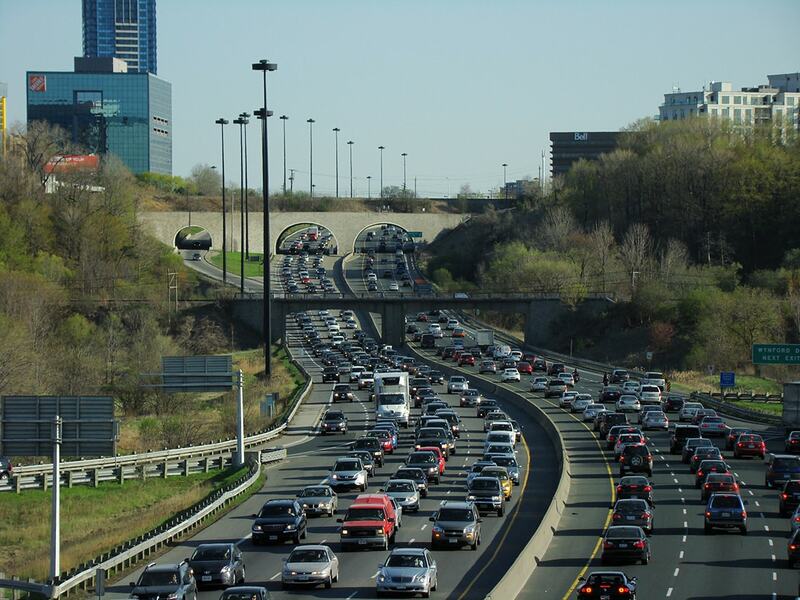 Toronto Mayor John Tory announced plans to implement a $2 road toll for the Gardiner Expressway and Don Valley Parkway today, hoping to generate much-needed income for the city. The highways carry thousands of commuters in and out of the city each day, but Tory said the tolls would raise $200 million every year – funds that could then be used for transit costs and expansion projects. With $33 billion in unfunded capital projects, the city is in need of a new source of revenue, he said. Tory also proposed a number of cost-cutting measures such as a hotel tax and a 2.6-per-cent reduction in the operating budget of city divisions like police and libraries. U of T's Institute on Municipal Finance & Governance (IMFG), which is part of the Munk School of Global Affairs, released a paper this week outlining different taxing options for cities like Toronto in order to generate revenue. U of T News spoke with Enid Slack, IMFG director and co-author of the report about Tory’s toll proposal and alternative revenue sources. Why does Toronto need more sources of revenue? What we've talked about in our paper is really the demands on municipal expenditures and how they've changed over the last 30 years – so for things like roads and transit, investing in infrastructure that's deteriorating, investing in new infrastructure. Our cities over the last 30 years are more interested in being more internationally competitive and that means not only providing water, sewer, roads and the traditional services but also making our cities very livable so we can attract young, skilled workers. Frankly, they can go anywhere, but we want them to come here. The list goes on and on for the expenditure side of the budget, but when we get to the revenue side and look over the last 30 years, nothing much has changed. Cities in Canada have property taxes, user fees and some provincial and federal transfers so the time has come to think about what other sources of revenue are appropriate for cities. When we looked at cities around the world – they all have other sources of revenue. They are not reliant on property taxes as their only source of revenue. This is not as bold as you might think. Other cities are doing this, and other cities have tolls on their major roads. Other than generating income, what are the benefits to introducing road tolls? The obvious benefit is to reduce congestion so that fewer people will get in their cars – maybe they'll carpool or maybe they'll take transit. It has a lot of time benefits for people and environmental benefits – less pollution, fewer health care costs as a result, fewer accidents, less policing costs. There are a whole lot of benefits over and above just the revenue. The point with tolls is that the users of the road are paying for it – whether they live in Toronto or somewhere else. And if the money is put into improving the roads or into transit, everybody benefits as well. Tory also proposed a hotel tax during today’s announcement – an initiative included in the IMFG paper – what can this kind of levy provide for the city? Hotel tax has advantages because it's a tax on visitors. When visitors come to the city, they use services. They walk on the streets. They use parks and policing services, and they don't pay any taxes in Toronto. A hotel tax is a way to get tourists to pay for some of the services they use when they're in the city. Other cities in Canada have hotel taxes – Vancouver, other B.C. municipalities, Montreal, Charlottetown. When you look around the world, many cities have hotel taxes. How can Torontonians be convinced that increased taxes or taxes on more services will benefit them in the long-run? We shouldn't start the conversation with taxes. We should start the conversation with what's our vision for cities in Canada. What do we want to see? People know what they want. They want good services. They want good transit. They want roads that aren't congested. They want parks. They want libraries. And we have to pay for them. If they have some understanding that those taxes are paying for these services, that they are getting something for their taxes, I think they're less unwilling to pay taxes. Some politicians will also need convincing that taxes are a good idea. How can that be done? If we want a great city, we all have to understand – citizens and politicians – that we will have to pay for it. If we don't, our cities will crumble. Infrastructure will deteriorate. The services won't be very good, and people won't be very happy when that happens.